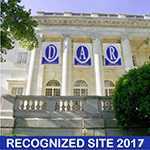 The National Society Daughters of the American Revolution (NSDAR or DAR), founded in 1890, is a service organization dedicated to service to the Nation. It's objectives are historic preservation, promotion of education, and patriotic endeavor. Photo credit: "Muwekma Ohlone Tribe, Muwekma Ohlone Tribe San Jose, CA Home." Muwekma Ohlone Tribe, Muwekma Ohlone Tribe San Jose, CA Home. N.p., n.d. Web. 29 Jan. 2017.